Are Your Processes Begging for Change? Peter Drucker identified process need as one potential source of innovation in an organization. In his definition, he describes a process need as an improvement that is obvious to almost everyone involved yet no one has taken action to make it happen. 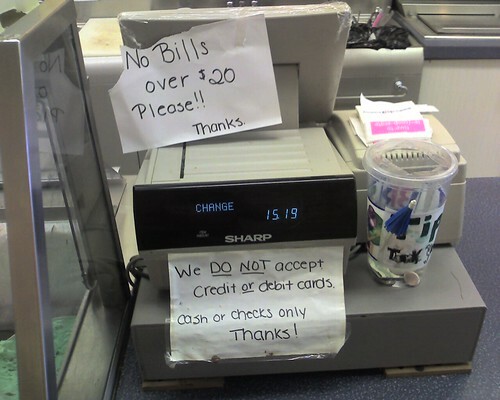 If the methods of payment you accept generate enough comments that you feel compelled to post a sign to preempt the complaints, you have yourself a mighty fine process need innovation opportunity! The solution here is obvious and a thoroughly solved business problem. However, the short-sightedness of a small business owner unwilling to pay credit card transactions fees leaves thier cashier on the cutting edge of 1970s technology. 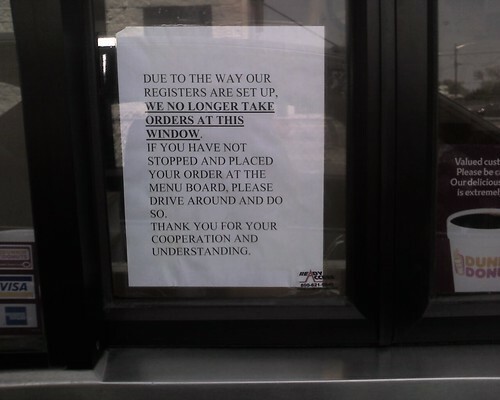 A register upgrade at this Dunkin Donuts shop eliminated the ability to take or change an order at the window. Thus, this sign directing their valued customers to please circle the building and stop at the speaker/microphone this time! These rather silly examples prove the point: what is screaming out for improvement in your organization that you no longer even see because it has become normal? What metaphorical (or actual!) signs have you put up for your customers so they will stop complaining about your broken processes? This entry was posted in Innovation by David. Bookmark the permalink. I just forwarded this post to my superiors regarding the money we leave on the table with our org. websites. Hopefully this will help get the ball rolling. And the owner wants you to TIP for your inconvenience! haha. Isn’t that hilarious! Talk about mixed messages.